Dinh Tien Hoang street located east of Hoan Kiem lake are many historians and writers as a place of convergence for several thousand years the sacred air of Thang Long – Hanoi. 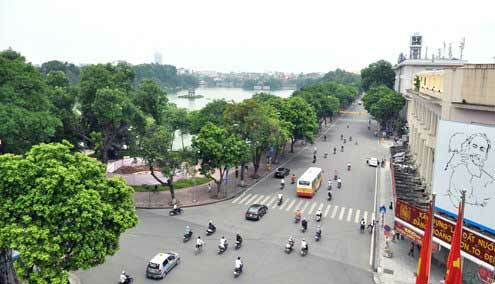 Hanoi has many streets, each of which are less marked when starting up the history of formation. Even over many years, vestiges of the old still form the soul street- the cultural space left for tomorrow. One of the streets associated with the cultural space of thousands of years of culture capital of the Dinh Tien Hoang street. Dinh Tien Hoang street is only about 900m long, starting from the intersection of Trang Tien – Hang Khay, go through the administrative centers such as Hanoi People’s Committee Office, Hanoi Post Office, Hanoi Power Company, through the ruins : Bao An pagoda, Ly Thai To square, Ba Kieu temple and ended in Dong Kinh Nghia Thuc square (where meeting place of the street: Le Thai To – Cau Go – Hang Gai – Hang Dao). In French time, street named Francis Garnier boulevard.In 1945, Director of Hanoi – Dr. Lai Tran Van has changed Francis Garnier to Dinh Tien Hoang St to remember the merits of the Emperor unification country – Dinh Bo Linh. Over the years with many dynasties, Thang Long has many names. 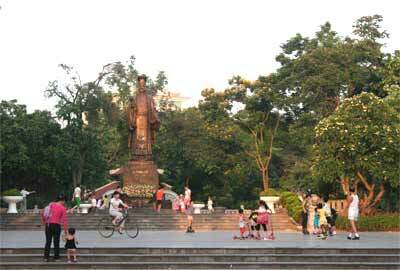 Several large temples and buildings were typically built on the ancient ring of land east of Hoan Kiem lake. Ba Kieu temple worship Mau Lieu Hanh, up nearly opposite the Le Ngoc Son temple from Le Than Tong seventeenth century, followed by the Bao An Pagoda, also known as the Quan Thuong, built in 1842, when it was big and beautiful temples in most of the city. Then in 1865, King Tu Duc, Phuong Dinh Nguyen Van Sieu who a good literary that contemporary call “Sieu spirit” to build this Ngoc Son temple port, Dai Nghien and Thap But. 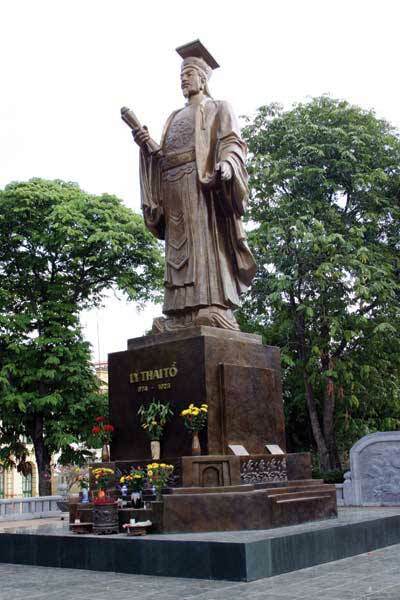 And the eloquent symbol for the uprightness of the man who is Thang Long lasting to this day the Dinh Tien Hoang street. In 1888, the French established city of Hanoi and began expanding into the Southeast with the goal of building Hanoi into a major city in Vietnam, meets the criteria for a European city worthy Indochina Federal capital of French . So when planning to build a new neighborhood with European architecture alongside the old quarter, they identified Hoan Kiem lake areas is central in Hanoi. Implementation guideline traffic ahead, a series of streets around the lake was built. That create large way to travel along the lake, the French opened the way cross the temple and three gate of Ba Kieu temple. That is the Dinh Tien Hoang street now. Then continue to new roads open through the Bao An temple area. Traces left of the temple today is Hoa Phong tower, located on the ground ring the lake. Leaned to look across the street from the Dinh Tien Hoang is Hanoi post office. In 1884 to the first post office was built, in 1901 the Post Office building on the lake of the Bao An pagoda completed. Next is Lake Lamps factory is located to the right of the Court of Directors. Electric bus in 1900 Lake was built, completed in 1906, the tram line from Bo Ho to Mo market, running through the Dinh Tien Hoang Street. Place is the administrative center, cultural – social capital, Dinh Tien Hoang street witnessed many important historical events of the country and Hanoi. It was early morning on 10/10/1954, last French soldiers left town camps Security over Dinh Tien Hoang to withdraw one’s troops to Long Bien bridge. Soon after that people had rushed out to welcome the troops to win here since the takeover of fallen into the capital. Over 30 years later, lunch 04/30/1975, Hanoi People flocked glad sword lake, squeezed tight Dinh Tien Hoang Street, Ho Chi Minh City People’s committee, gardens Chi Linh, Ngoc Son Temple, bus station… excited Saigon (Ho Chi Minh city) liberation heard through speakers in the ineffable joy. 20 years later, on 07.10.2004, at the Chi Linh garden in Dinh Tien Hoang Street has added a new event of historic Hanoi thousand years old: the inauguration Ly Thai To monument, the King laid the foundation for sustainable Thang Long – Hanoi. Bronze statue is cast solid outline positions King watched impassively from the city and the country is innovation. Dinh Tien Hoang street not only filled with historical “beautiful Ho Guom”, with a cultural center, the normal day as well as holidays, new year always Dinh Tien Hoang street is also where people in the districts and localities in the country, foreign tourists go to. And also from here that they emit different streets to see Hanoi. So most of the major traditional festivals of the country and Hanoi as fireworks celebrate the National Day, New Year, cycling, running newspaper New Hanoi Award, the walk for peace, music performances … are well organized on this street. In recent years back to add new festivals such as the Flower Festival in Hanoi and Vietnam (the first time at the end of 12/2008), Street Arts Festival by the City People’s Committee and the Embassy of Denmark (times beginning 11/2009) was held on Dinh Tien Hoang street …As a rule, on the night of the 30th annual New Year, generally around Hoan Kiem Lake, the largest of which is on Dinh Tien Hoang, Hanoi who have went here to pick up Eve, the Ngoc Son Temple, Ba Kieu temple, statue of King Ly Thai people … pray for national security state, for the new year has been abundant health, enjoy business prosperity, lucky. From the leaders of the party, State, Government and the city government to the people, from elderly, middle-aged to the boys, girls, young children … are all respectful incense thought remember King Ly Thai To, who was enlightened with the paralysis of the city, fallen, the national hero … poured their strength, wisdom and blood to build and protect the sovereignty, protection of capital, for today’s children can live in peace and independence. With memories of the Lake, the pages have learned, with monuments and works of architecture worship, we suddenly realize that going 1000 from Thang Long to start now, rarely have a street on this country has a rich historical evidence about the past and today, weave together the cultural and spiritual space, which is considered as the most beautiful capital of Dinh Tien Hoang street.